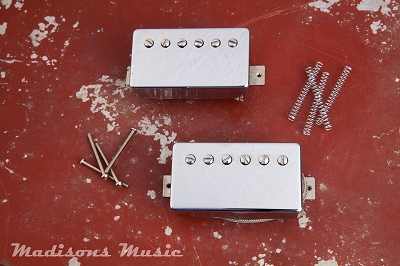 Crystal Clear Pickups T-Top Inspired Humbucker set. Hand wound with a vintage 42 gauge wire and mismatched coils. Chrome cover. Much like its predecessor the PAF these pickups have defined string definition and clarity! Coils are slightly underwound, Buytrate. 70's NOS Alnico 2 bar magnets.